The relaunch in April of Santorini’s loveliest Spa at the Canaves Oia Hotel. The 17th century Canaves that are carved into the Cliffside, have been modified and transformed into designer-chic luxury Suites, oozing the sophistication of minimalism. Elegance and harmony hidden in simple, dazzling white forms against the velvet blue of the Aegean Sea, make this five star hotel in Santorini the perfect hideaway for romantic couples and dreamy weddings. Relax and unwind in the heavenly infinity pool. Experience unsurpassable luxury and indulgence in one of the most fascinating sceneries, boasting uninterrupted panoramic views and world-class services. 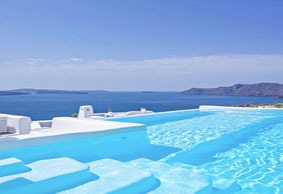 Canaves Oia Hotel makes a dream getaway a reality.